What you eat and drink can make a difference in the condition of your teeth and gums, and a nutritious, well-balanced diet is vital for great dental health. When your diet lacks the proper nutrients, it may cause the tissues in your mouth to be less capable of fighting off infection and disease. Therefore, those with inadequate nutrition are potentially more at risk for gum disease and the resultant tooth loss. Additionally, when you eat and drink and how you combine the items you consume can impact your oral health. To help you make the best nutritional choices, here are some basic steps you can follow to keep your teeth and gums in their best shape. Avoid sugary food and drinks, as foods that contain sugars can contribute to tooth decay. When sugar comes in contact with the bacteria in your mouth, acids form which can break down the tooth enamel and lead to decay. Bacteria can also inflame the gums and erode the bone that supports the teeth making them susceptible to loosening and putting them at risk for loss. If you do eat sweets, stay away from sticky and slowly dissolving candies such as caramels and hard candies that remain in the mouth for longer periods of time. Carbonated soft drinks should especially be avoided as they have added acids that can compound the erosion of tooth enamel. However, a terrific alternative for after a meal or anytime is sugar-free gum. Chewing sugar-free gum can help your mouth to produce saliva that reduces acids and flushes food particles. Since saliva is key to limiting the damage to teeth, remember that foods which are eaten as a meal produce more saliva than snacks do. So, reduce the number of snacks you eat and when you do snack, choose something healthful. Healthful nourishment may come from a wide variety of foods including whole grains, fruits, vegetables, low-fat or fat-free dairy foods. In addition, lean sources of protein like fish, lean beef, skinless poultry and dried beans, peas and other legumes are good choices. Grains, vegetables and fruits contain fiber to help clean your teeth, while dairy products contain calcium that re-mineralize and strengthen tooth enamel. Drinking plenty of water can flush your mouth of bacteria and food particles, and both green and black teas contain polyphenols that can help to prevent bacteria from growing or producing the acid that attacks teeth. 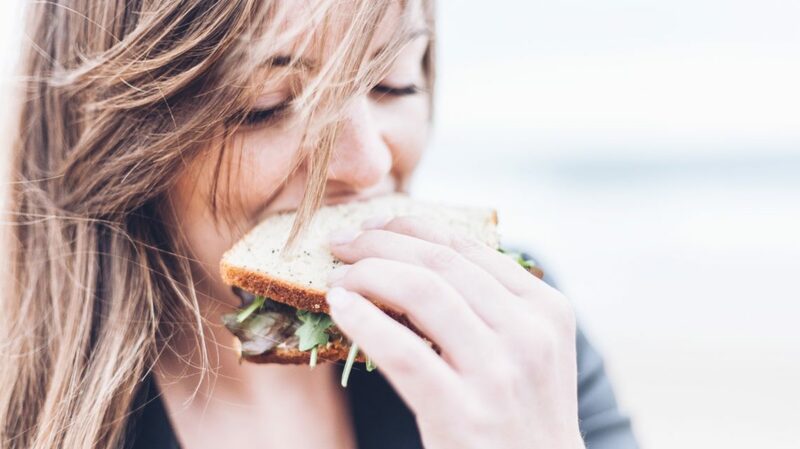 If you would like more suggestions for eating a nutritious diet and to enjoy the associated dental health benefits, Dr. Heidi Finkelstein and her caring staff at My Plantation Dentist can help. To schedule your appointment, please contact us today at 954-584-1030.